There's no denying that children get a lot of vaccines during the infant and toddler years. While there are many good reasons to provide these vaccines to your child, it doesn't take away from the fact that they hurt and can be a huge stressor for parents. During the first year of life, children need vaccines every few months, and they often get multiple shots at each visit. These vaccines provide much-needed protection from serious and deadly diseases, so they are necessary. But no parent wants to see their child in pain. Although you can't take away the pain of these vaccines completely for your child, there are things you can do to reduce the stress for everyone involved. You should be given Vaccine Information Sheets (VIS) about all of the vaccines that your child will receive during her visit. However, there is a lot of information on those pieces of paper and it may not be feasible for you to read it all while you are waiting for the vaccines to be given. If you have questions or concerns, you can find the vaccine information sheets online prior to your child's appointment. You can look at the recommended vaccine schedule to find out what your child will need and find the accompanying VIS for your child's age. This is a tricky recommendation. There is a lot of inaccurate and misleading information on the internet about vaccines. "Doing your research" does not mean reading every blog and opinion out there and basing your decision on vaccines off of those. It does mean seeking out reputable sources to educate yourself about the necessary vaccines and what to expect from each of them. Sources such as the Centers for Disease Control and Prevention (CDC), American Academy of Pediatrics (AAP), and KidsHealth.org are all trustworthy options when you are looking for well-researched, science-backed information. Look for the HONcode symbol on any health website you are reading. To earn this seal, websites have to adhere to strict quality standards. Vaccines protect our children from dozens of diseases that once sickened and killed millions of people in the United States and around the world. Although some of them are virtually non-existent in the US now, that is because vaccination efforts have been so effective. Unfortunately, these diseases are not eradicated from our planet and if we stop vaccinating, they will come back. Continuing vaccination not only protects your child but it protects others who either cannot be vaccinated or are at high risk for another reason. If you have questions about the vaccines your child needs, write them down. 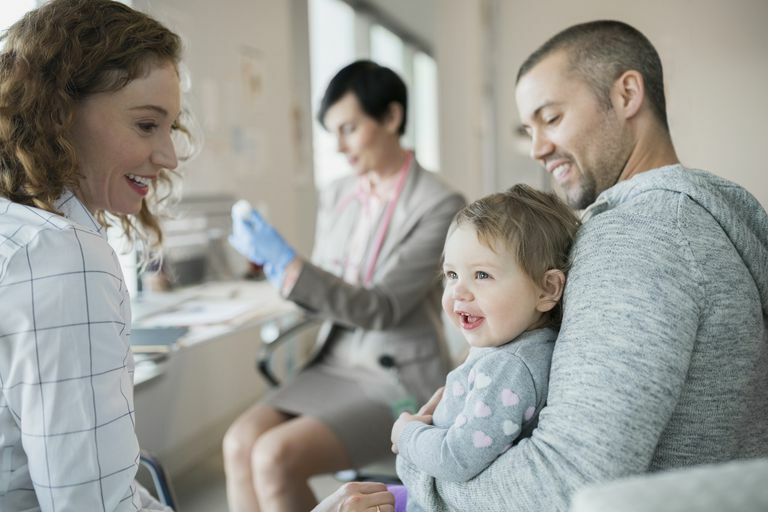 Office visits can be hectic, especially with young children, and you may forget the questions you have when you are in front of the doctor. Keeping a list will ensure that you get all of them answered. Making sure you have your child's vaccination record is also very important. Some states keep vaccination records electronically but your health care provider may not use that system. Additionally, if your child has received vaccines in another state, your new doctor may not have access to those records. Keeping a written record of all the vaccines your child has received throughout his life will ensure that he gets all that he needs and doesn't get unnecessary vaccines that he has already been given. Young children don't understand the purpose of vaccines and there is no way you are going to convince your toddler that a shot won't really hurt. Or if you do, she won't believe you again the next time. Although adults understand that the pain of a shot is temporary, in a child's mind, it can be overwhelming. Having objects on hand to distract your child can go a long way in providing comfort during a stressful situation. What you use will depend on your child and his age. If you have a young infant, feeding him or offering a pacifier after vaccines may be comforting. If your child is a little older, bringing a book, snack, favorite toy or other activity can be a good way to keep his attention off of the shot. If you are anxious about the particular vaccines or the number of injections that your child is receiving, speak up. Tell your doctor that you are worried and why. There are reasons why the vaccines are recommended in the order and number that they are, but hearing those reasons directly from a physician that you trust can help ease some anxiety. If you have a chance to read the vaccine information sheets prior to your child's appointment, you can discuss any questions or concerns you have with her physician during the visit. If you appear to be anxious and worried about the vaccines, your child will be also. Children pay close attention to their parents' body language and emotions than most of us realize. The more confident and calm you are, the easier the appointment will be for your child. The most common vaccine reactions are mild pain, swelling, and redness at the injection site. Some children may develop a rash or a fever. Talk to your child's doctor about how to manage these reactions if they occur. Most fevers can be managed with over the counter fever reducers if your child is uncomfortable. Ibuprofen should not be used in infants younger than 6 months of age. If you see other symptoms that concern you, contact your child's pediatrician. For a day or so after their vaccines, your child may feel more uncomfortable than normal. This is expected but you can help your child feel better by providing reassurance, a little extra attention, and plenty of fluids. She may have a decreased appetite but making sure she stays hydrated is important. Don't worry if she doesn't want to eat as much as normal, just keep offering fluids like milk and water. Infants should be given breastmilk or formula as appropriate for their age. If your child is sick the day that he is scheduled for his checkup and vaccines, talk to his doctor about whether or not he can still be vaccinated. In most cases, minor illnesses are not a reason to avoid vaccines. If your child has a high fever, his doctor will likely ask you to come back to get the vaccines after he is fever-free. Symptoms such as a runny nose and cough are not a reason to skip vaccinations. Never threaten your child with a shot as a punishment. Although it may be tempting to use the threat of a shot as a way to get your child to behave, it only teaches your child that a shot is something to fear and that doctors and nurses are punishing them when they do need shots. It sends the wrong message to your child and causes unnecessary anxiety. Don't walk away from your child during the injection. Your child's doctor or nurse may need help holding her while she is getting her vaccines. Although some parents are reluctant to be involved in the process, it's important to stay with your child. You are a familiar face during an event that can be frightening for a child. Holding your child during vaccinations is comforting to her and can help reduce the chances that she or someone else is injured while the vaccines are administered. If you aren't sure how to do this, talk to your child's doctor to ask how you can best help.